Looking for the best YouTube video downloaders for Android in 2019? I tested 15 downloaders on Android, and only seven could work. In this article, we are going to explore the all-time best YouTube video downloaders for Android in 2019. YouTube’s terms and condition do not allow anyone to download videos from YouTube until there is not any official download button to download the video. However, if you still want to download YouTube videos then check out this article before downloading a wrong app. It doesn’t do the best job, but the app is good for short term usage. SnapTube Downloader is a great YouTube video downloader for Android, and it does download videos from YouTube. I also ran into a couple of problems 👇. If you are looking for a long-term YouTube video downloader for Android, then SnapTube Downloader might not be the perfect solution. The app has its own interface where you can browse YouTube videos. Check out: UFO VPN Review. A unique interface. It comes with a new interface, but everything is up-to-date from YouTube. It doesn’t require any special and sensitive permissions. The downloading speed is slow as compared to other YouTube video downloaders. You can’t play the video in the downloads menu of the app because if you tap on a video, it goes to the Play Store and shows you an app to download. You can play the videos from your video player or files, but do not play from the downloaded menu. You can download the SnapTube from here. The app works perfectly fine. You can use Videoder to download videos from over 30 services including YouTube, Instagram, Facebook, Twitter, and Dailymotion. You can also download some other stuff; if you know what I mean. Anyway, the app has a different interface where you can search for videos. You can also tap on YouTube to go to the YouTube website and search for videos. It supports most of the extensions and video qualities. Other than that, if you are looking for a built-in downloader for Instagram, then it can download videos straight in the Instagram app which makes Videoder one of the trusted YouTube video downloaders for Android in 2019. Videoder comes with a new interface where you can search for videos. Asks for location, and SD card media modify permissions. Download Videoder from Uptodown here. Undoubtedly one of the best YouTube downloaders for Android. InsTube did an excellent job surprisingly. The first thing, the app doesn’t require any special permission to run. It only requires storage and location permissions. InsTube supports over 30 websites including YouTube, Instagram, Facebook, Dailymotion, and Twitter. You can also watch videos from “+” sites. The only problem I found is ads which I don’t think are harmful. The app shows you trusted AdMob and AdSense ads. The app doesn’t require any special permissions. Download InsTube Free Video and Music Downloader from Uptodown here. The trusted app KeepVid Video Downloader is one of the great YouTube video downloaders. The app only requires storage permission and runs smoothly. The only problem I found is, even the app is closed the notification is visible “KeepVid is running, tap here to find more or stop”. I can stop the app, but the notification doesn’t look good if a person does not know how to get rid of it. 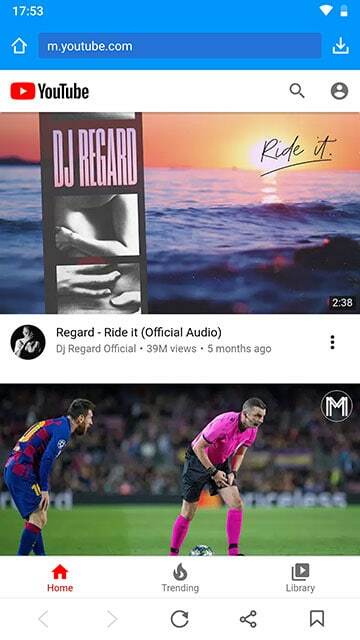 KeepVid supports many websites, and it comes with a new interface, and if you want the YouTube, you can tap on the YouTube button. KeepVid doesn’t require any special permissions. Notification is visible all the time. Download KeepVid Video Downloader from Uptodown here. Simple, secured, and trusted app TubeMate is the best YouTube video downloader in the market. The app is easy to use. It comes with tutorials to explain how to use the app. Regarding permissions, it asks for location and storage. The app is perfect for downloading YouTube videos on Android devices for free. You can select the video quality and an extension if you want. The app supports MP3 format if you want a song in audio. The app is an excellent YouTube video downloader for Android in 2019. TubeMate doesn’t ask for any special permissions. Light and doesn’t show so many ads. Download TubeMate from uptodown here. I also tested Dentex YouTube Downloader, WonTube, NewPipe, Vuclip, TubeX, YouTube Downloader for Android, YT3 TouTube Downloader for Android, and VidMate, but those apps either ask for sensitive permissions like accounts info, device identity and get access to contacts or do not download the videos at all. I would recommend you to download one of the above YouTube video downloaders for Android to download the YouTube videos securely. By asking for sensitive permissions apps are stealing your data and selling to other companies. Always keep yourself away from these apps. Anyway, thanks for reading the article. I hope you found the best YouTube video downloader for your phone. Do you know any of the apps which are not listed here? Please let me know so I can review and add the apps to this article.